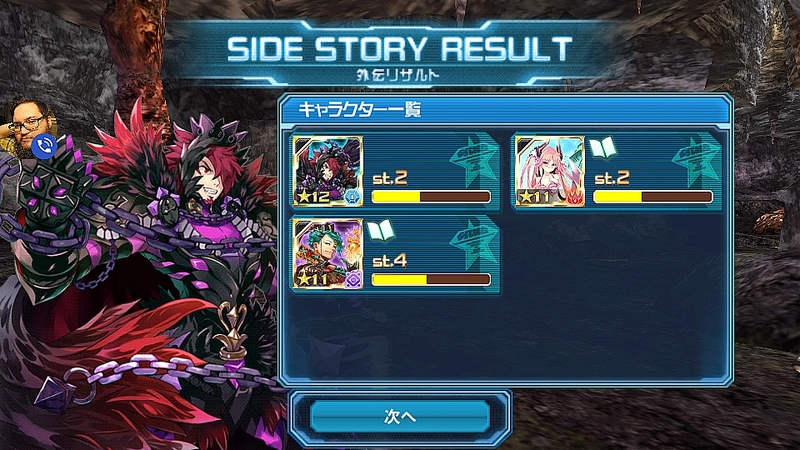 Side Story Quests follows the adventures of various character and Weaponoid chips collected by the player. 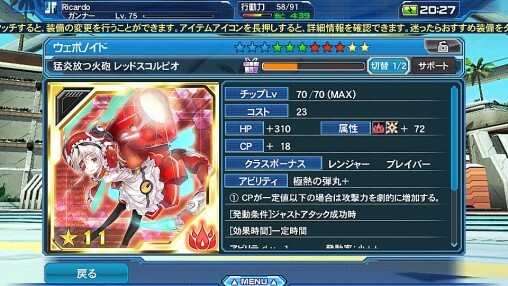 These chips can be obtained in various ways, such as through Story Quests, Special Quests, or esScratch (Gacha). Tap the green Chara button to see a list of Weaponoid and Character chips who currently have a Side Story. This window displays all the weaponoid and character chips that currently contain a side story. You can switch between each category by clicking the tabs on the left side of the window. You can only complete side stories for chips you have personally obtained. If you do not possess the chip, it will appear grayed out in the list above. Beneath the chip’s name are the letters [st.#] and its [side story bar]. The [st.#] signifies the side story quest we are currently unlocking. Once the bar reaches max, it unlocks the next side story quest. There are 4 bars in total signifying the 4 side stories we need to unlock. So for example, once [st.2] is full, it will upgrade to the next bar in succession which is [st.3]. Underneath the bar are the number of side story quests you have completed for that chip. For example, [1/4] signifies that you have completed one side story out of four for the chip in question. 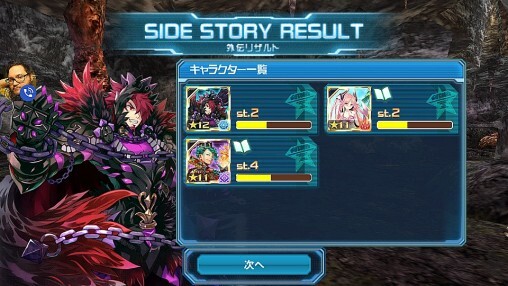 In order to raise the [side story bar], you’ll need to equip the chip with you out on quests. The bar gauge will only rise once you’ve completed a quest. You can perform any quest that you like, but it’s best to choose quests that normally consume a lot of Drive. Tapping a chip from the list will bring up the Side Story Quest Selection Menu. For the most part, chips that are obtained from the esScratch usually require their [st.#] gauge to be at a certain level before the subsequent quest is unlocked. 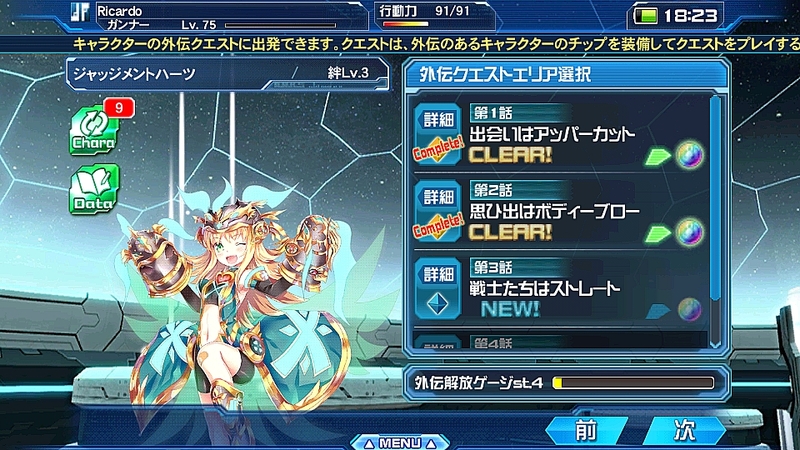 However, certain character chips have additional unlocking conditions for each quest. They’ll not only require the [st.#] gauge to be at a certain level, but may also require completing story chapters in certain seasons. 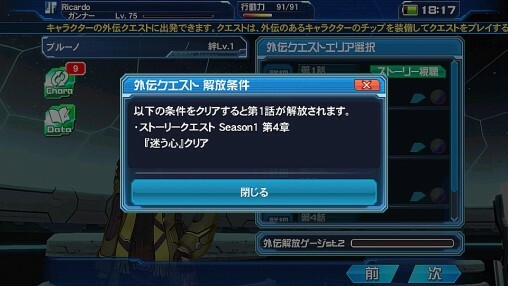 For example, Bruno’s chip requires you to clear Story Quest [Season 1: Chp4] before the first episode of his Side Story unlocks. 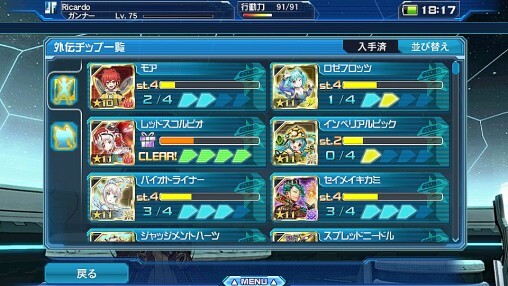 You can unlock further abilities on your weaponoid or character chip by completing ALL the chapters within the chip’s side story. Some effects cause your chip to cover an extra element, while others may extend the chip’s duration, reduce chip costs, or even increase the elemental value. You may have noticed that one of the chips in the screenshot has a purple present box. In order to unlock gifts from your weaponoid and character chips, you must clear ALL of its side story quests. Once this is done, the [st.#] bar will turn into a present bar, providing your character with a random gift each time the bar is full. 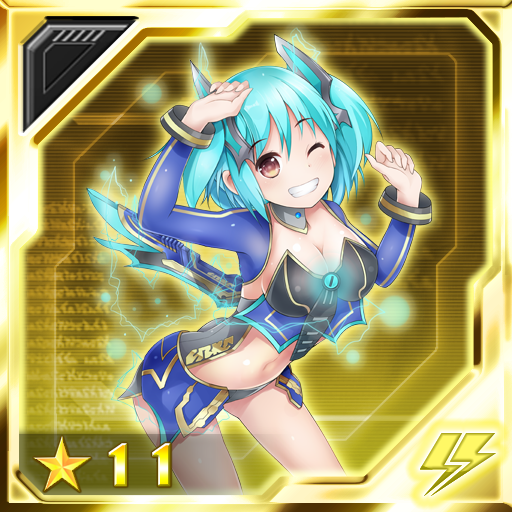 Collect these to unlock potentials for specific weapons on PSO2. Collect 10 for Weaponoid Chips from previous EQs. Collect 20 of these for Sigma Weapons or Weaponoid chips. You can trade in Weaponoid Stones at the Exchange Shop. If you haven’t already guessed by now, Weaponoid chips are based on weapons of the same name. 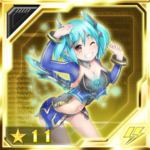 If you equip a Weaponoid Chip and its corresponding weapon, the following effects can occur.